Thinking about starting keto but have a few misgivings? Are your friends and family telling you that keto is not a healthy diet, or you can't maintain it for long? Let's address these keto myths once and for all. I first learned about the ketogenic diet when I was studying nutrition at the Institute for Integrative Nutrition, and it immediately piqued my interest. At that time, I was freshly off of my first Whole 30, which you may be familiar with as basically an uber-strict paleo-esque diet restart, if you will. I was feeling pretty great at the time—mentally, I was sharp (very important in my day job as an editor), I hadn’t had heartburn or acid reflux since who knows when, and my energy levels were great throughout the day, which had certainly not been the case throughout most of my post-puberty life. However, I’d been discouraged at the end of my 30 days when the scale said I’d only dropped 3 lbs. Maybe that was unreasonable of me, but I had watched my mother and friend do the same Whole 30 and lose 12 and 14 lbs, respectively. And they were following my Whole 30 meal plans, no less! It was quite the bummer. Also, to be quite honest, I missed cheese. Oh, I missed it so so much. But anyway, I digress. When I first heard about the ketogenic diet, I was intrigued, but I wasn’t sold. Eating fat to lose fat? It just seemed too good to be true. I put it out of my head and carried on eating paleo, hoping my results would eventually manifest themselves like they seemed to do for everyone else. Everything changed when I went to a health conference about two weeks later. During the two-day conference, I got to hear from two renowned and well-respected doctors, Dr. Mehmet Oz and Dr. Mark Hyman, and coincidentally, both of their talks centered around the benefits of a ketogenic lifestyle on the brain and body. I walked out of that conference sold—I was going keto. That was four years ago now, in April 2014, and I’ve never looked back! Since then, I’ve earned my health coach certification and decided to coach what I know: how to live a ketogenic lifestyle to achieve the health results you want. I’ve talked to hundreds (if not more) people about keto in the past few years, and I’ve run into my fair share of misconceptions about a keto diet. 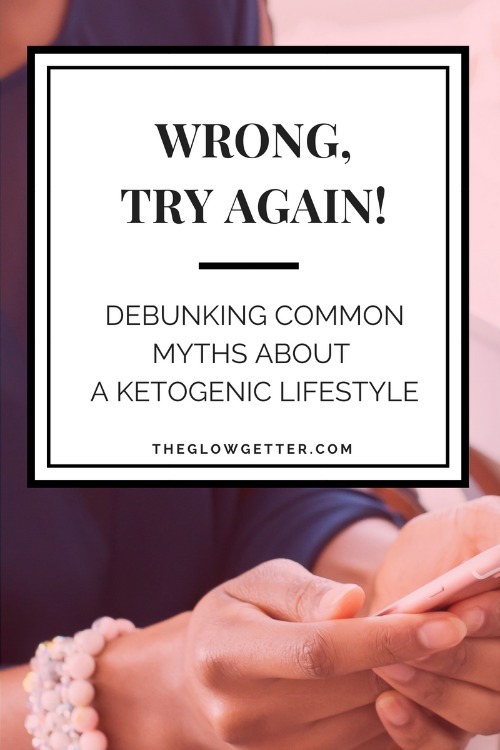 Below are the most common myths about keto, debunked with both my and my clients’ personal experiences and published research. 1 // Keto is a fad diet. If I had a dollar for every time I’ve heard this one. Although keto is picking up in popularity in recent years, it actually was formally established in the 1920s for treating epilepsy. During clinical tests, doctors noticed that not only was the high fat, low carb diet controlling the amount of seizures in epileptic children, the children were experiencing higher cognitive abilities and increased alertness and energy. The diet’s effects on body composition (i.e., weight loss) were discovered later, and have since been helping men and women shed weight for decades. Acid wash jeans are a fad—keto is here to stay. Me, sustaining about 50 miles of cycling (including the ride to and from the start) after only a bulletproof coffee before the ride and macadamia nuts and water with electrolytes during. 2 // You can’t sustain exercise on keto. Tell that to the many ketogenic athletes out there—the athletes who follow a keto diet participate in activities from basketball to bodybuilding to Ironman events. It’s often said that you need carbs for energy to participate in sports or heavy lifting, but many people find that once their body learns how to use fat for fuel, they actually perform better than they did when they relied on carbs. I’ll add a personal note to this: in the four years since I’ve been keto, I’ve done two half century (50 mile) bike rides, one century (100 mile), and countless other 30+ mile bike rides, all without hitting a wall and refueling with carbs. In addition, I supplement my bike rides with high intensity interval training to build strength and power. No issues yet! 3 // Keto is difficult to maintain. Even four years ago, this wasn’t true. Keto is no more difficult to obtain than any other way of eating, it just requires knowing what foods are best for you and eating accordingly. What people mean when they say this is that they may actually have to cook foods sometimes instead of hitting a drive through for every meal, or that they can’t grab snacks and go like they can with other ways of eating. However, today, even that is not true! Keto folks have it good now—as the diet increases in popularity, there are even more restaurants and food companies who cater to a high fat/low carb clientele, making keto easier than it’s ever been. 4 // Your body can’t survive without carbs. *looks down at surviving body* So far, so good. This myth comes from the misconception that glucose (carbs) is the best source of energy for your body. However, once your body becomes fat-adapted, it actually works more efficiently. 5 // Keto will make chronic diseases worse, or cause them. This just gets debunked left and right daily. The fact alone that keto is endorsed by so many doctors is enough to make you reconsider what keto can do for you. Anecdotally, as more people are turning to keto, there have been countless stories of people getting off of medications for high blood pressure, diabetes, and high cholesterol. If you want to be bombarded with people telling how keto has helped to manage or eliminate chronic diseases, take a glance at the keto section of reddit. 6 // All people eat on keto is bacon. I’m not quite sure where this myth came from. I guess, supposedly, people on keto eat a lot of bacon...but I think most people do, in America at least. I will say that bacon is a great source of fat while being lower in protein, which makes it a great keto option, but it’s definitely not the entire diet. At the base of the keto diet is low starch, green vegetables, healthy fats, and then a little protein...bacon optional. 7 // You have to eat 5x a day to keep your metabolism up. This is a pervasive fitness/diet myth period that I felt I should address here. The common theory is that you eat several times a day to fuel your metabolism, the logic being that it is always working, turning the carbs from the Standard American Diet (SAD) into energy for you. I’m about to blow your mind, kids: the opposite is true on keto. Because of the high fat nature of keto meals, once your body is fat-adapted, you stay satiated (full) for much longer. In addition, it doesn’t need you to refuel it with energy that often because you have pretty much an endless supply of fat already in you that it can rely on. It’s one of the reasons keto and fasting tend to go hand in hand—often, on keto, you’re simply not that hungry. 8 // Keto is just another name for Atkins. I hear often, “Oh yeah, I’ve tried keto before... I used to do Atkins.” While Dr. Atkins was revolutionary for introducing a low carb diet at a time when the wheat industry was convincing the government to consider bread as the foundation of a healthy diet, Atkins is not quite keto. The Atkins diet focuses more on lowering carbs than raising the fats. A huge component of keto is the high fat aspect, as those good fats are what is going to really fuel your body. 9 // Keto is not sustainable. Some people say that keto is good for quick weight loss, but that it's not capable of sustaining long term. Well first off, my four years on the keto diet determined that was a lie. But don’t just take it from me...there are many people who have been following a ketogenic way of eating for as long as I have (or more!) with great results, most famously, Jimmy Moore of the Livin La Vida Low Carb podcast. 10 // There is only one way to eat a high fat diet.